Any excuse for a weekend in Paris is welcome, and when walking around one is tempted to pop into a few of its magnificent churches, with the occasional bonus of hearing an organist practising, instead of the more usual canned music. Nothing could be more inviting to Musical Pointers than the rare opportunity offered by these Journées de l'Orgue Contemporain. 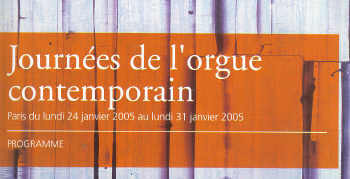 The organ department of the Paris Conservatoire has been looking outwards in a unique week-long festival of contemporary organ music, with concerts, seminars and masterclasses all around the capital. Such an in-depth exploration of this repertoire is believed never to have happened elsewhere. The academic sessions were conducted exclusively in French, and better command of the language was needed to follow the analysis of Pierre Leguay's new Péan than we could muster. So this is a one-sided notice of a wide-ranging event, featuring organ music by Berio, Feldmann, Guillou, Kagel, Lenot, Ligeti, Messiaen and Xenakis amongst numerous organist composers. Those are less generally known because their instrument has been somewhat marginalised from the mainstream classical music scene, on account of its primary liturgical function and the location of the majority of fine organs in churches. A full length recital of radical contemporary organ music, well attended at Notre-Dame, made for an uniquely satisfying experience. François Espinasse, pupil of Milhaud and Messiaen, and successor of Boulez as director of Domaine Musical, began with a substantial piece from 1981 by Gilbert Amy, which sought to reintegrate digital virtuosity into a musical horizon often limited to ' effects of sonority and other futilities'. Amy's musical language avoide cliché and, in this performance, excessive loudness too was abjured. The organ intrigues him for its colours, always different from one instrument to another. It was a peculiar pleasure to be listening with a sympathetic audience, many of them organists doubtless, to hear every detail of the music on offer and to discover how excellent was the acoustic of the august cathedral (no blurring reverberation mid-nave in Espinasse's perfectly judged performance) at first seemingly incongruous with the venerable surroundings, but quickly feeling absolutely right there. Amy's Quazi una toccata is definitely a work deserving a place in a balanced repertoire, and was an ideal start to a wide ranging programme and our weekend. For the most spectacular modernism Bernhard Haas took us back thirty years for Xenakis' Gmeeoorh, his first essay for the instrument and one of such outrageous modernity that it brought smiles of incredulity and delight to many astonished Parisians. Using his system of arborescences, with rotations and distortions, the sound picture, continually changing, was riveting to hear live, its dynamics ranging from the lower limits of audibility to a mounting crescendo reaching 'a monumental paroxysm of sound of which only the organ is capable'. Of the organist-composers featured, I was most impressed by the Belgian Phillipe Boesman's Fanfare II based on Machaut's Kyrie Cunctipotens, which could be felt throughout, and its melody heard distinctly pianissimo towards the end. He was self-taught and had been influenced by fruitful contact with Souris, Pousseur, Berio, Boulez & Sockhausen. The Sunday was given over to a promenade dans Paris to hear organ works in four churches where they had been premiered. It was clearly a vibrant social occasion for the organ fraternity who had assembled for this unique week. But reservations must be expressed for non-specialist visitors who pored over maps and negotiated the journeys across the city for scrappy recitals of excerpts from larger works. The sound of modern musical idioms is not unfamiliar to the large Parisian congregations for whom church-going is still a central way of life, but it seemed at the Eglise de la Trinité, where Messiaen had presided for sixty-one years, that the closing improvisations at the end were being overheard during general discussion and children's playing, rather than being listened to attentively. Few of the congregation remained after the end of morning service to hear the resident organist, Marie-Bernadette Dufouret, play a couple of items, Messiaen's Dieu parmi nous and Hakim's Pange lingua , a disappointingly formulaic piece dedicated to her; she could do little with the over-reverberant acoustic of this barrel-vaulted church. Was it thus during Messiaen's reign? At St Ferdinand des Ternes two student organists (J-F Hatton & M Lecomte) gave us a sequence of little pieces commissioned for the 1995 dedication of its new Pascal Quoirin organ; those by Pécou and Mallié were promising but over too soon, without developing their material as it deserved. At St Antoine des Qinze-Vingts. Eric Lebrun scintillated in Casteréde's delicious Ton Ame Danse dans la Lumiere; Jacques Charpenter's Mystere was too bound by its liturgical destination to make a significant independent effect. We rushed across to Notre-Dame des Blancs Manteaux, arriving just a little late for the mere 17 scheduled minutes of little excerpts from substantial works by four composers. We were especially taken by the middle movement of Lejet's Triptique and tantalised by being deprived of her outer panels. Likewise the Entrée to Reverdy's Mass left us feeling that these two women composers, neither of them organists, had a lot to offer to the instrument in the 21st Century. This peripatetic event encouraged visitors to explore unfamiliar corners of the city, but programmes of 40-45 mins would have made the effort feel more worth while. 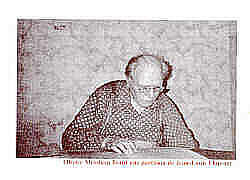 The final concert of the festival, given in the Salle Olivier Messiaen of Radio France by the Swiss virtuoso Tobias Willi (heard previously in Lucerne) was Hommage à Jean- Louis Florentz (1947-2004), an important composer virtually unknown in UK, admired by Messiaen (pictured below studying a Florentz score, from an exhibition at the Conservatoire). The console was brought forward onto the stage and one had the pleasure of watching the athleticism of the player's hands and feet, manipulating the stops and ranging with accurate precision over the five keyboards from seats at the side of the front row - elsewhere in this fine concert hall leg room is as restricted as on a package plane! That visual dimension of enjoyment and appreciation is denied in most churches, with the executant remote in the organ loft and the music heard from behind. Messiaen's Messe de la Pentecôte made for compelling if austere listening, leavened by the composer's delight in birdsong, to the fore in the Communion section. 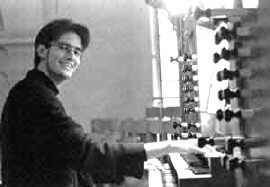 Jean-Pierre Leguay's new Radio France commission Péan II treated luminous material attractively, save for a vacuous final ffff chord, a common trap for organist composers. Florentz's Laudes (1983-85), inspired by Ethiopian liturgy, and first encountered in last year's Lucerne Festival, should become a staple focus in the contemporary organ repertoire. The melody of the Ethiopian Magnificat Watibye Mâryâm appears in pure form in Mary's harp, the third of the seven sections of this 32 mins major work. It is music of at times daunting complexity for the player, but clear and communicative to hear, and with some lengthy passages in unassuming single line melodies. Radio France was broadcasting this recital live; hopefully Tobias Willi's performance may become available on their extensive CD releases of Musique Francaise d'Aujourdhui.